EtherDFS is an 'installable filesystem' TSR for DOS. 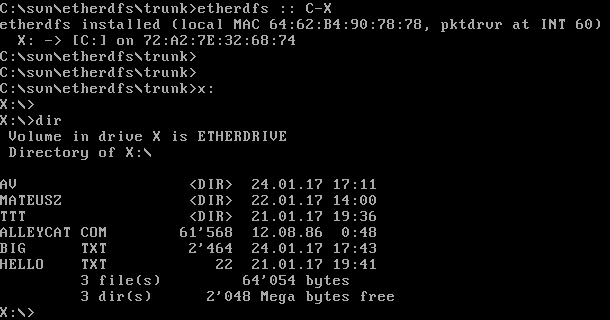 It maps a drive from a remote computer (typically Linux-based) to a local drive letter, using raw ethernet frames to communicate. For years, I was using LapLink to transfer files between my various "retro" computers. It works, yes, but it's also annoyingly slow and requires constant attention. One day I thought, "Wouldn't it be amazing if all my DOS PCs could share a common network drive, similarly to how NFS operates in the *nix world?". This day EtherDFS was born. Works at layer 2, no need to mess with layer3 / ip : I like it. You still need a (network) packet driver thus. it could revamp god ol'DOS usage.